MacTalk - What's Up With the Mac Pro? What's Up With the Mac Pro? I've whined before here about the lack of external facing Mac Pro related activity within Apple, but I thought it was time to go over some facts again, about how we got to where we are, and to day dream at what a new Mac Pro could bring. The current Mac Pro platform (based on the Nehalem core Xeon CPUs) was released in August 2010, with a mild update in June 2012. Apple is selling those now, for $2,999 (oh, you can't even buy a Mac Pro in the EU now and in the USA, you'll only pay $2700 including CA sales tax). The Mac Pro right now, is over 3 years old. Eons in technology years. The Mac Pro itself is even based off the PowerMac G5 released all the way in 2003. There hasn't been a major redesign of the Mac Pro in almost 10 years. Since the CPUs in the current Mac Pro were released, there's been the shift to Intel's 32nm process chips, with the E5 range of Xeons, which have been updated twice since the last Mac Pro. The Mac Pro has missed out on Thunderbolt, PCIe 3.0, USB 3.0, SATA 3.0, and the latest range of graphics cards from AMD and nVidia. Not to mention a significant increase in raw CPU power, which is the whole point of a Mac Pro anyways. Imagine how fast you could encode video out of Compressor or Squeeze using a Mac Pro with dual Xeon E5-4650s (20MB cache, 2.7GHz up to 3.3GHz, 8 core CPU)! The poor Mac Pro has been left to dwindle away, a generation or two behind what used to be, Apple's performance king. John Siracusa makes a very compelling case for Apple to return the Mac Pro to this - make the Mac Pro into a "halo car" in the same vein as the Lexus LFA is for Lexus or Formula 1 is for Ferrari. A super expensive car they lose money on, but damn, it's cool and is a showcase for the latest technologies that hopefully filter down to cheaper products. What can we expect in a new Mac Pro? Well, Intel's newest CPUs are codenamed Haswell and whilst aimed at mobile computing, Intel announced at their latest Intel Developer Forum in Beijng just last week, that there will also be new Xeon chips, based on a 22nm Ivy Bridge-EP platform which will have plenty of USB 3.0 ports, SATA 3.0 sockets galore and PCIe 3.0 slots for the latest graphics cards. It'll even have support for up to 12 cores, meaning a 24-core Mac Pro is entirely possible. E5 Xeon Ivy Bridge-EP based CPUs are slated for release in Q2 of 2013, so don't expect a new Mac Pro before that. There's an even faster range of Ivy Bridge-EP. Intel has also been talking up new Thunderbolt chipsets, codenamed Falcon Ridge, which will support up to 20Gbit of bandwidth. No doubt this would be in a new Mac Pro as well. Falcon Ridge is slated for release in early 2014. Also of interest to a new Mac Pro, is an update to the current generation Thunderbolt chipsets for the DisplayPort 1.2 standard, whcih supports 4K resolutions. Why is this important? Well if Apple release an external Retina display, it will be 4K (which just happens to be double what 1920x1080 is) and you can't release a 4K monitor if the Macs can't display it! These Thunderbolt chips will be out together with the Haswell CPUs in mid 2013. Maybe even a new case re-design could be on the cards. It will still need to be a great hulking big box, as as energy efficient as the new Intel CPUs are, they've still got TDP ratings of over 100W - big heatsinks and big fans are the only way to cool them down. Even if Apple do a repeat of the PowerMac Quad G5 and install watercooling systems (which are way more reliable now and very common place in PC-land), there's still a large radiator and fans required. 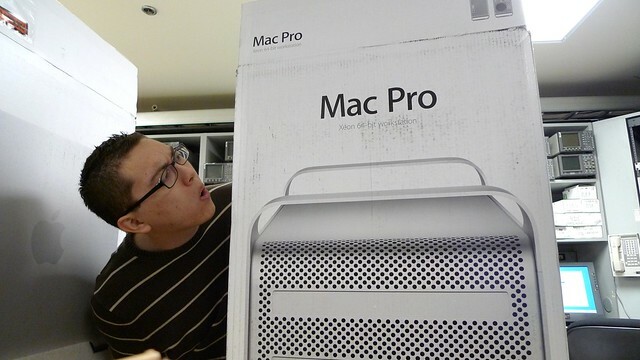 No Mac Pro in a box the size of a Mac Mini any time soon. There'd also be the expected - SSD options (even Fusion drive), maybe a mix of 2.5" and 3.5" HDD bays and modern AMD or nVidia cards such as the AMD Radeon HD 8000-series (due out late 2013 or early 2014) and the GeForce 700 series, expected slightly earlier (but no ETA from nVidia).